Are you attending a Memorial Day Party or hosting your own party this weekend? Or are you in need of a quick dessert for the weekend? Don't worry! Try the Easy Flag Fruit Dessert – festive and refreshing. Grab a roomy rectangular tray and load it up with some red, white and blue. Here's what you need: plump red cherries, little yogurt or white chocolate covered pretzels, tasty strawberries, delicious raspberries, and dazzling blueberries. These are some of the freshest fruits and a sweet and salty flavor will make you crave more. 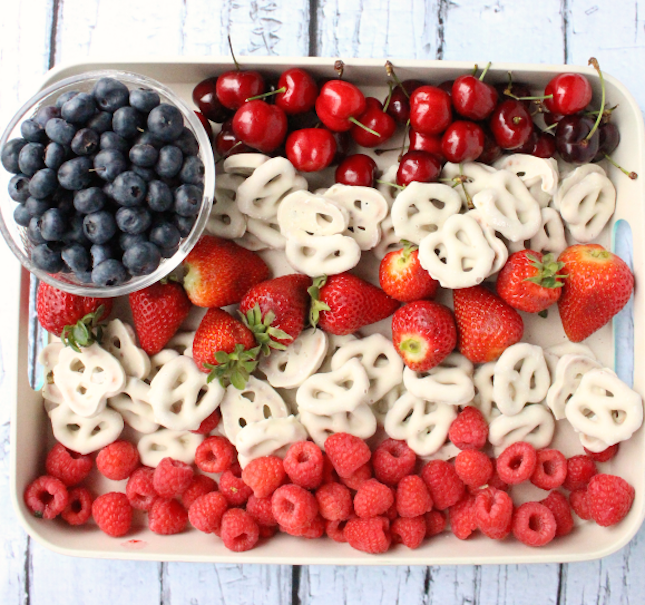 The easiest part is just spreading these colorful fruits and yummy pretzels by color coordination (hint: red, white, red, white, and red, and blue in the top left corner) Sounds easy enough. See picture below for how it should turn out. Happy Memorial Day residents of Altamonte Villa Apartments.